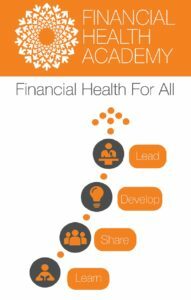 In 2017 we will be launching our Financial Health Academy, a place for training and professional development for those who are committed to tackling financial health issues in their community. The Academy will offer you a suite of online and face-to-face training courses to improve understanding of financial health issues; strategic support to help you develop and test your ideas; and opportunities to share your learning with others to achieve greater impact. We will be launching our first on-line course in 2017 and are currently seeking views on the learning and development needs of people across the sector. You can help us by completing the survey below and telling us how we can support you to develop your financial health practice. We know that sometimes you require training that is unique to your organisation, specific to your clients and community, and aligns to your organisational aims. Our bespoke training can help you create and deliver effective programmes and integrate financial health into everyday practice. Even if you’re not sure exactly what you require, give us a call and we can work with you to establish what your needs are. It’s not just training we provide, we also create bespoke materials and resources for developing the financial capability of others.